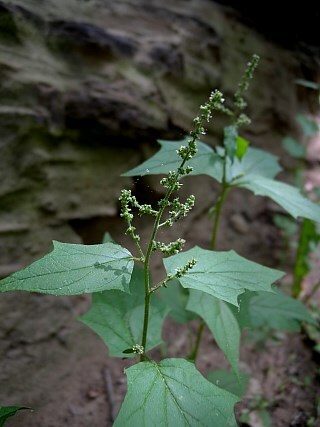 Chenopodium simplex.John Hilty.illinoiswildflowers.info. (Accessed 5/2014). Chenopodium simplex is an annual C3 herb (Jacobs 2001), to 1.5 m tall, erect, bright green. Leaves alternate, stalk elongate, blade broadly egg-shaped to deltoid, 5-20 cm long, with 1-4 large lobe-like teeth per side, tip pointed, base blunt to lobed. 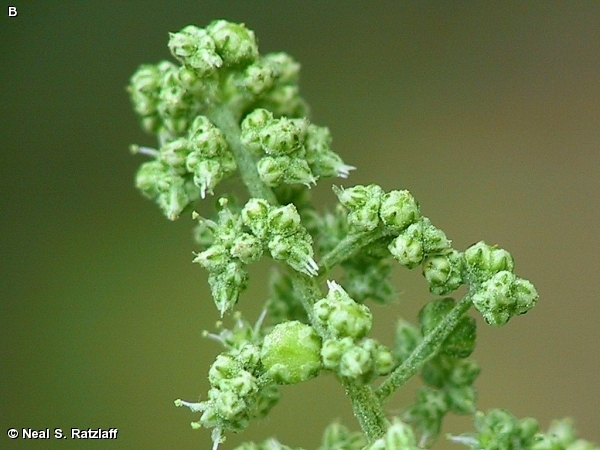 Chenopodium simplex flowers. © Neal S. Ratzlaff. Fontenelle Forest. Nature Search. fnanaturesearch.org (Accessed 1/2018). Flowers minute; inflorescence terminal, branched spikes. Fruit to 0.2 cm, seeds horizontal, shiny, black (Stalter and Tang 2002).